By default employee and direct manager(s) from the structure will be added. Manager can be deleted from trash sign behind the name. When additional manager needs to be added, it can be done from Add responder. A pop-up windowwill be opened and a person from structure can be added or someone outside the structure by writing the email address and name. Deadline for answering can me changed from here - from the pencil sign behind the date. Questionnaire template can be changed from here - selection will be opened from pencil sign. After selecting the template it will be apparent also in this view. (The questionnaire has to be prepared by HR person or manager already earlier). Send out questionnaire - from the rocket sign. Employee will receive a invitation with answering link by email. From Start answering here the answering view will be opened. When at first time all the questions wont be answered then employee can stop and start again any time from the link in email- all previous answers are saved automatically. When employee has inserted all answers and pushed Send to participants, manager will receive a invitation for answering. 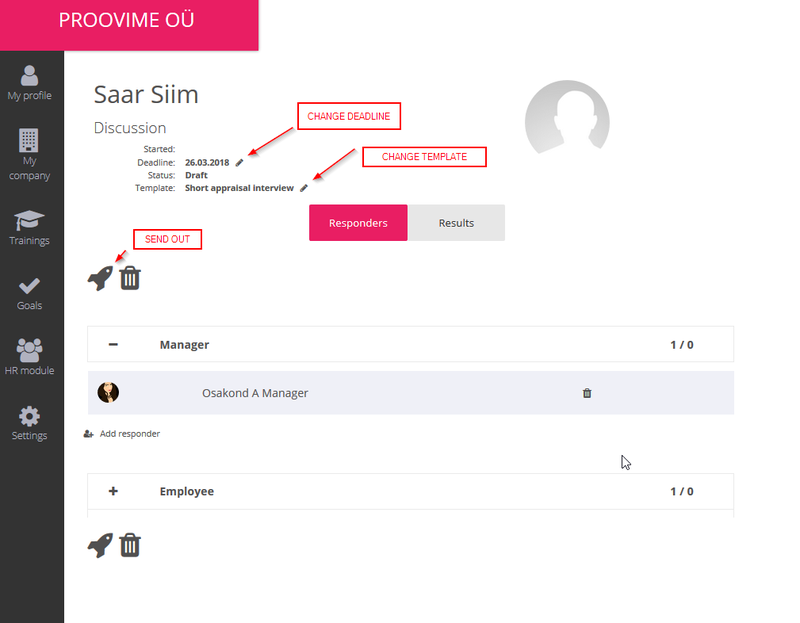 Now manager can answer but also see employees answers at the same time. Send to participants - answers will be saved and sent to employee. Employee will receive email with text: Your appraisal interview survey has been updated. Please view the questionnaire here. Employee can see managers answers and add something to own answers when needed. So all participants can change or add their answers several times. Confirm - manager can change the status of discussion. After that the result are also shown in employees profile - Received feedback. But also in confirmed status answers can be changed and added when necessary. All previous data is shown with dates added and wont be deleted or overwritten. Every time after adding or changing the other participant will receive an email with note about updating. When its absolutely certain that all answers are given, manager can finish the discussion. Finish survey - discussion will be finished and cant be reopened again for answering. Results can be found and downloaded in under employees profile - Received feedback. How to customize answering view? How to change survey email messages?